So much happens when winter turns to spring - all this renewal. Easter is a holiday of rebirth. The flowers start poking out from the ground. The dead trees look alive again as their greenery returns, as well as the white and the pink if the tree flowers that way. The lawn becomes a shades closer to the blend of blue and yellow and less of a blend of brown and more brown. The birds return, as do the bees and wasps. 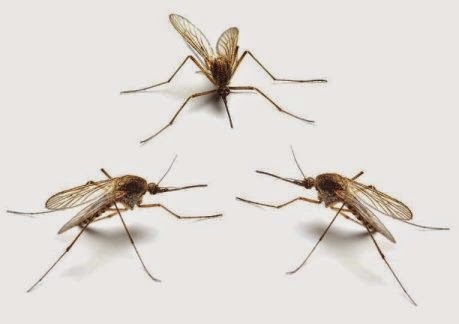 Luckily we are still a few weeks away from the flies and mosquitoes from showing up, but they will be here. Ok, attack the BBQ on the count of 4. BREAK! Hopefully, one of the renewals coming will be the rebirth of a certain blog. Chris, from Old Foul Cardboard, has been too far out of commission behind the keyboard. Now, Chris and I chat a bunch over text, so I know he's busy with work, family and life. It's always nice, though, when someone writes. I find blogging to be cathartic. It's a place to channel my emotions, or my stupidity. At least if Chris isn't blogging, he and his son still find some fine cardboard at shows in his area. That is some primo miscuts right there. It's hard to pick a winner between mini Reggie and Mac. Non 90 degree corners vs. complete lack of a team name. Plain pretty they both are. As one can expect, I never see anything like these at my LCS or a card show for a price I am willing to pay. My hope is Chris picked these up for a dime. Maybe a quarter. Danks went right into the throwback binder. 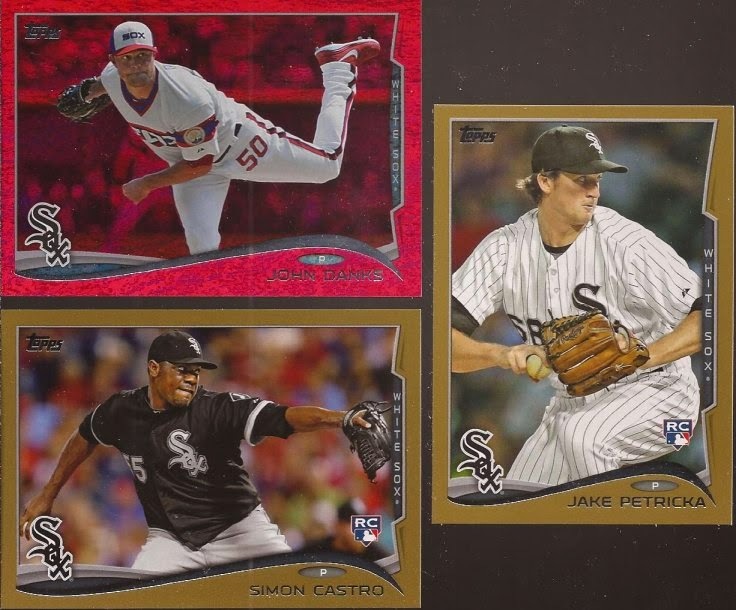 I think the Target border works a little better with the beach blanket throwbacks than the blood foil. Seems like plenty of Hawks out east as well. 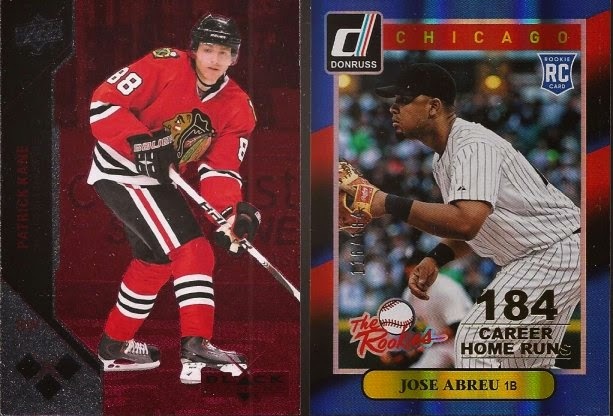 A nice triple diamond of Kaner paired with a Abreu Donruss cards. 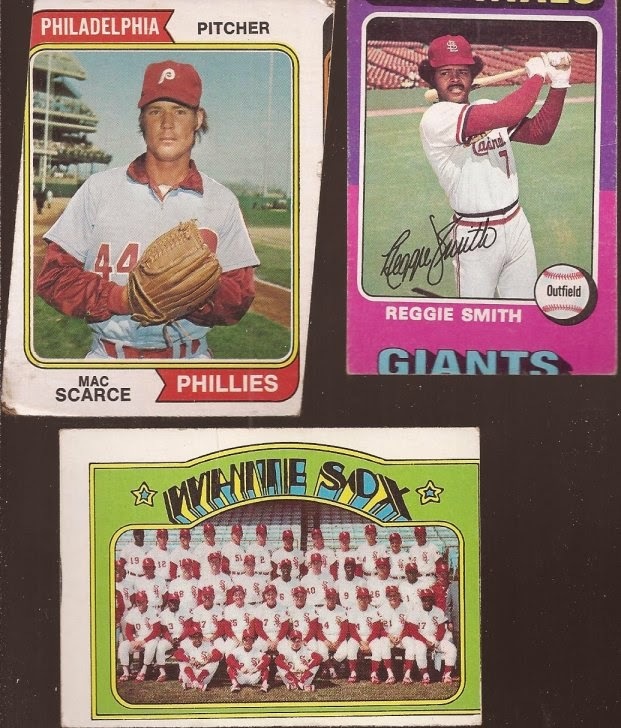 I still want to like Donruss. This design works, except for the foil paper. I've decided, however, that the two miscuts in the first image tie for 2nd compared to this one. 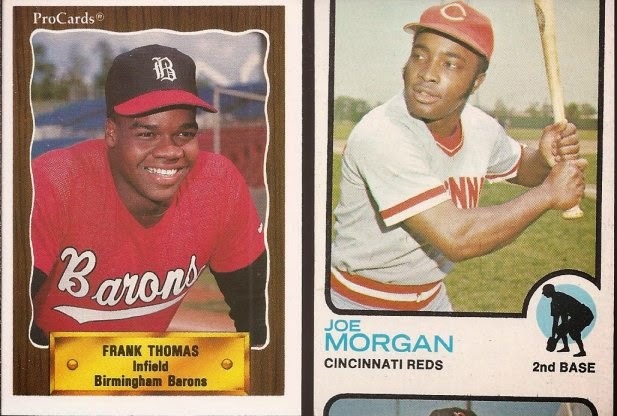 Joe Morgan?! Heck yeah! Nothing like a HOF'er in the miscut binder. Speaking of the HOF, how about that pre rookie of the Big Hurt? I like the position listing of "infield". I don't think Frank ever played another spot than first. Thanks as always, Chris. Find some time for your blog - it's lonely. Love the miscuts. I really need to finish scanning my error collection and post them. Nice pickups. Miscuts are always interesting. I think the Scarce angle miscut is the coolest of the trio. Scarce and Morgan, tied for most twisted card! Your love for the miscut is admirable! Speaks to your sense of humor, I think - a cut up! I'm always on the look for one of these throwaways, knowing it will have the best of homes in your collection.